The National Book Festival is happening in Islamabad at the Pak-China Friendship Centre from April 5-9, 2018. We attended the festival last year and had a great time! Read our tips on how to make the most of this great event for book lovers. Firstly, I was super delighted to see great attendance by children, parents and the elderly for a literary event. 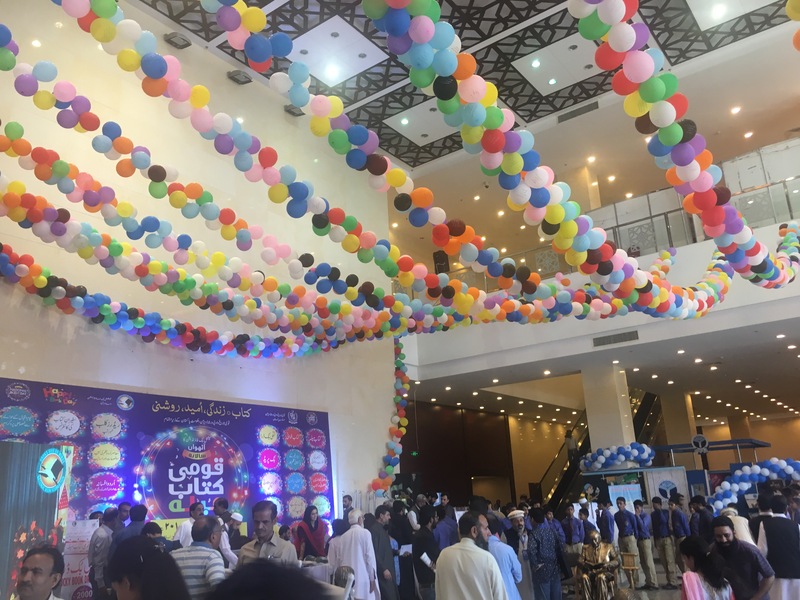 There is something for everyone at this book festival: book stalls with new and old books, great discounts on books, literary talks, performances and activities for children. My children (them ages 6 and 2) particularly enjoyed the face painting by Lynx School, the art exhibition by GSIS Schools and the old books section by Community Development Council. There were also arts and crafts stations for children, story telling, henna and word puzzles. Along with book stalls there are exhibits by related organizations such at Pakistan Post (where we bought some fun historic stamps). The National Book Foundation Mobile Library is also parked outside along with a fun science bus and the mobile Book Club. Master Ayub from the famous Street Light Park School in Islamabad will also be at the event 3 – 7pm. No cars are allowed inside the gates and you will likely find parking far away. Be prepared to walk (a lot). You can bring prams for small children as the exhibit area is fairly accessible. Bring lots of water, the only place selling food and drinks is outside and around the main hall. Bring cash and lots of Rs 100, 50 and 20 notes. All vendors were accepting cash but were short on change. Bring your own bags to carry the books. Most vendors did not have bags to hand over with the books. The National Book Foundation website and Facebook page has details of the talks and the exhibits. Do attend the National Book Festival! I plan to go inshaAllah also. You’re awesome…im new to islamabad and love ur take on things here..am desperate to get mynkids on urdu bandwagon..but finding it tough…are u still in islamabad…would love to meet you if ur still in town! LOVED the Festival as always. It’s a relief to see people thronging to buy books and events like this prove that the love for books isn’t history yet and it’s only a matter of providing the right kind of patronage to keep the spirit of book loving alive. What I would love is to see book stalls that are more tastefully decorated so that even a casual visitor would be inclined to buy at least one book !